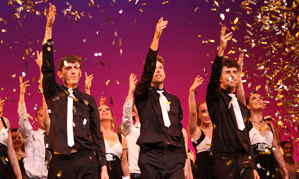 On 3rd and 4th July 2013, Reynolds Performing Arts took part in the biggest production of PEAK to date. Peak 2013 ‘Fusion’ was performed at the Orchard Theatre in Dartford. It was a fantastic showcase of the student’s and college’s hard work, which has received great reviews and drew in our biggest audiences to date. Due to the commitment from all the talented staff, the show was a visual ‘Fusion’ from the performance numbers, to the beautiful lighting and music choices. Each number linked into the next which meant you did not have a minute to breathe. It was like a non-stop roller coaster ride of endless talent and a test of stamina for our performers. Two of our professional year students have been offered contracts with Spillers Production Company as a result from performing in PEAK. Ben Carter and Katie Monks will be performing in pantomimes this Christmas season. May we take this opportunity to congratulate them and everyone involved in Peak 2013, we look forward to the next one! Do you or someone you know have a passion for performing? Why not try one of our free trial classes. For more information on these and about Reynolds Performing Arts contact: danceschool@reynoldsgroup.co.uk or call 01322 275807.